Day three and the coaches were in Ngwazini for Community Rugby Session. Everyone gets involved at the Ngwenyameni Community Rugby DayDay two of Community Rugby Coaching at the coaches were in the mountains at Ngwenyameni Community. Likima players at the Community Rugby DayThe coaches were in Likima to hold a Community Rugby Session. Players of all ages turned up on the day. Imbali Rugby logoThe SRU will be holding a U/19's Girls 7's Tournament at the St Anne's Sports Ground next Friday to kick start 'Imbali Rugby' SRU Development Coach Michael Dos Santos made the announcement today at the Rugby Union offices. The tournament will be the official launch of Imbali Rugby which is the name given to Women's Rugby within Swaziland. Wilson Dlamini with the TOP16 polo top.Wilson Dlamini the SRU's Schools Development Coach was showing off the new TOP16 Polo shirts donated by the SKRUM Programme. 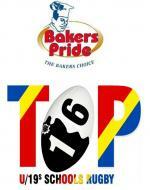 The tops all branded with the TOP16 logo and Swaziland Rugby Union will be given to the sixteen participating schools head teachers and coaches. Schools Development Coach Wilson Dlamini with some of the LV-SOSKitaid kitThe Swaziland Rugby Union took delivery of a load of kit donated through the SKRUM Programme by UK charity LV-SOSKitaid. This is the first delivery of LV-SOSKitaid for 2013. The Hippo's Rugby Club from the town of Dvokolwako proved too strong for everyone on Saturday when they walked away victors in the second Maganu 7's Rugby Tournament played at the Kwaluseni Sports Ground on Saturday. The SRU will be holding a 7's Coaching Workshop for the Schools Coaches who will be participating in the TOP16 In ter Schools 7's Tournament to be played in May. SRU President Michael Collinson made the announcement at the Rugby Union offices today. "We have been approached by several Teacher Coaches and Youth Coaches to hold the 7's Workshop, we have received twenty three applications to attend. 7's at schools level is strong and interest is growing with more schools asking to host tournaments. The 7's Coaching Workshop is therefore necessary" said Collinson.